One of the easiest ways to reach a lot of potential customers is at a conference like Web Summit. With your next big event around the corner the time is right to consider your corporate and personal branding at the conference. In our fastly chancing world we all want to be unique and different from the rest of the crowd. With that fact, it becomes important for brands at conferences to stand out and make an unforgettable impression. How do you make your brand unique and likeable so visitors will recognize you and want to speak with you? 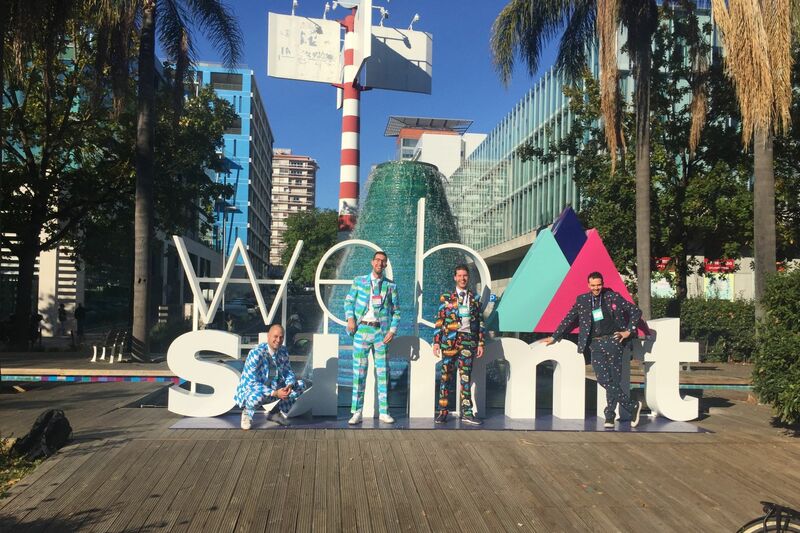 Marketing Madheads was very successful standing out at Web Summit. We love to share our thoughts and ideas with you. A couple of weeks before Web Summit we had a meeting with our Madheads team on how to rock Web Summit. This is your very first step leading up to the event! It is time to create a solid online marketing plan. 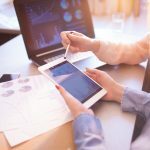 We understand the true value of all social media and are aware that social media engagements are extremely valuable for the conversations at the conference. In the last few weeks before the conference you can create a great strategy to build excitement, online visibility and attract a huge audience with your message. The social media landscape can be very overwhelming by all its functions and possibilities, but with all the tools of today we have chosen to use the Facebook Business Manager to promote our messages on Facebook and Instagram. We hope you already have some great ideas in mind for a big promotion! If this is your first campaign or can use some inspiration we love to share our online marketing strategy, best practices and results with you. Before you start creating a campaign in the Facebook Business Manager you should think about a great and relevant message you want to promote. Get your team ready to brainstorm about a strong promotion. Since we are Marketing Madheads we wanted to create a mad campaign. We decided to shoot a promotional video to trigger people to visit our booth and find us at the conference to start a conversation. Consider using the right hashtags along with your post to make sure you will be widely visible online. The next step but one of the most important ones is to create a target audience for your promotion. Think about people living in a specific country and who are interested in Web Summit. You can even target people traveling around the location of Web Summit in Lisbon during the conference! We knew Web Summit has a list of all attendees and speakers on their website and mobile app, that is our target audience! You are allowed to look those people up in Facebook and save their Facebook ID’s as a target audience, that is great, right? Now you can go ahead setting up your campaign. Take into account you need to set a time range and budget per day for your campaign. Our advice is to create separate campaigns for each platform (Facebook and Instagram) and target audience. When you are all set up, you are ready to launch the campaign and let the world know you are attending Web Summit. The result of our online marketing campaign leading up to Web Summit: 56.000 impressions, a reach of 28.000 people and 15.000 engagements of our promotional video! We reached those great results with a budget of €70 with an average cost of €0,005 per engagement. But most important we thank our results of the setup of the campaign. If you create a great message and set up the most relevant audiences we are sure you will reach those results too. As we told you before we looked up all attendees of Web Summit on the website and the mobile app. The application had the possibility to start a conversation with anyone attending Web Summit. We started conversations with attendees and made them aware of Marketing Madheads. As a result, we had many appointments scheduled at the conference before the first day of Web Summit and a lot of visitors at our booth. By making everyone aware of us wearing our crazy outfit we rocked the weeks leading up to the conference already! But how do you steal the show with your appearance at Web Summit exactly? Visibility is key at conferences like Web Summit. You might consider dressing up your booth to stand out of the crowd. Since the booths at Web Summit are not that big, look all the same and have some restrictions regarding adding stuff on and around it you have to think outside the box. You can also make your team stand out at Web Summit. Isn’t that great, also considering Web Summit is a huge conference? If you have multiple members stealing the show by their looks, visitors and attendees of the conference can’t ignore you! 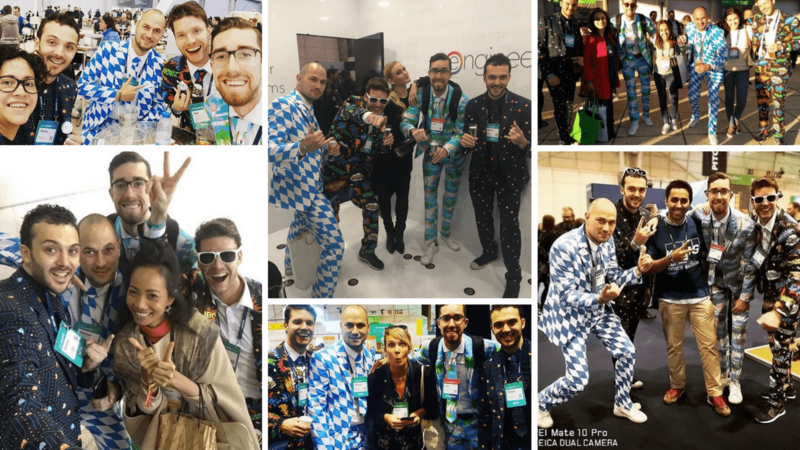 Since we are Marketing Madheads we decided to wear mad suits during the conference. 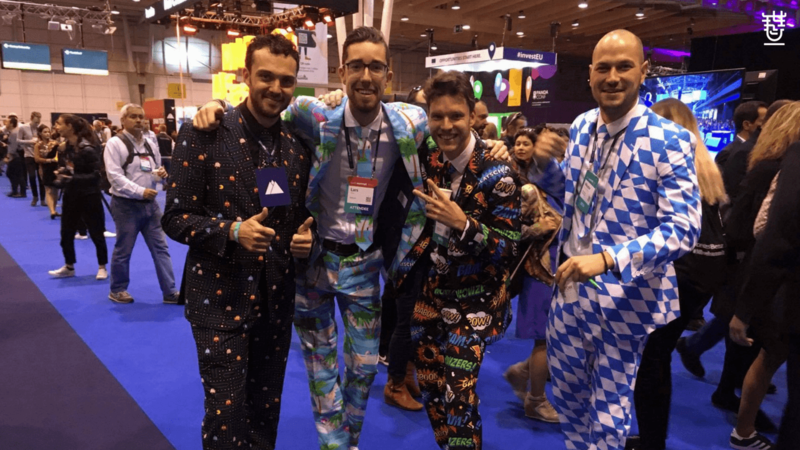 You might consider wearing the craziest outfit at the next Web Summit but be aware there is a clear link to your brand and core business. It was easy for us to explain why we wore the suits. Since our brand name is Marketing Madheads and develop online marketing tooling to make companies so skilled in online marketing they eventually won’t need an online marketing agency anymore, it is clear we are mad, right? It was a huge success for us since we stole the show at Web Summit, made many pictures and got noticed by a lot of press. Next to the looks of your team you should make your days at the conference unforgettable. Put on your greatest smile and share the joy of your team. Energize the attendees and visitors! This helps in both ways: it boosts your own confidence and energy and it makes the audience smile and curious about who you are. But with curious visitors comes a lot of questions about who you are and what you do, so what is your story? It is great you promoted your business online and steal the show by your looks at Web Summit but when it comes to your story you should be prepared for an elevator pitch! At a conference like Web Summit you have the possibility to talk to many potential customers, investors or collaborators. Do not underestimate the power of a good pitch so a story for glory is your next goal! Be short, be relevant and be appealing in your story. What is your core business, why do we need you and what makes you irreplaceable? By telling your story you should trigger people starting a conversation they will remember and easily pass on to others. Interact with the person you are talking to by asking relevant questions to make your answers more powerful and relevant. Our team started with the question: “What do you do online already?” Only with this simple question we already had a lot of information about the company of the person who we were talking to. With this information, we could easily adjust our elevator pitch for each person and tell our story in the most relevant way. The important next step is to give your potential customer or investor the best demo ever! Make sure you can visualize what your business does, so bring your laptop with you and show your pride. Our recommendation is to make sure you can tell everyone what you do and why you do it in an elevator pitch so they know your brand and core business right away. A demo should be a complement to your story which makes it all complete. Often a demo is what your audience will remember so rock your demo! Next to a story for glory and a great demo you can impress visitors at the conference with swag! What about some swag at Web Summit? We know you are not going to win Web Summit with giveaways but who doesn’t like a nice gadget at the conference? You can think of gadgets like pencils or notebooks, but we think you should go outside the box with this! Marketing Madheads created exclusive vouchers. Since we developed our own online marketing tooling Madhead Madonna we gave away free SEO consults and a free 1 month trial. When we discovered during a conversation someone was interested in our tooling we handed out this voucher. This is a great gift for both sides, our potential customer has the possibility to test out Madhead Madonna 1 month for free and at our side it is a hot lead: win-win situation! Since this is an exclusive giveaway only for people we have spoken to, we wanted to bring some mad swag too. 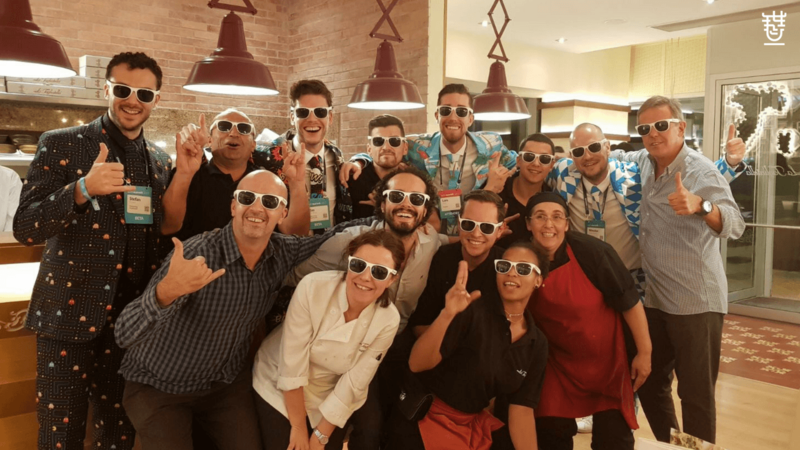 We knew a lot of people wanted to take a picture with us, so we took it to the next level: branded sunglasses! It might sound simple but this was a very effective swag for Marketing Madheads, see for yourself! The sunglasses made our pictures even more crazy and suited our online presence very well. It was nice to see a lot of pictures attendees and visitors of Web Summit took with us on social media. This online buzz is great but how do you make sure you see those pictures back on social media? Unless you are a big brand you are not going to have an instant online buzz. But wait, you do not need to be a big brand, there are some simple steps to boost online buzz during Web Summit. The first few hours at the conference were overwhelming for us since we had so much attention of the crowd and took a lot of pictures. But we had no control of the pictures taken and we wanted to boost our online buzz. To create online buzz, you should think cliché now: sharing is caring. We asked everyone who took a picture with us to share it on Facebook and Instagram using our hashtag #marketingmadheads or account ID @wearemadheads. The result was dozens and dozens of pictures and videos with our team online! 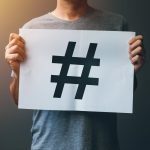 Do not underestimate the power of a good and unique #hashtag because it helps creating awareness for your brand but also to monitor who is talking about you online. Now you can easily track the activity of the hashtag. The result of our strategy was more than one hundred new followers and over one thousand likes, comments and views, all organic! But most importantly we discovered a lot of people recognized us at Web Summit. Next to many attendees and speakers the media and press knew about us too. During Web Summit, we had a couple of interviews with media like the well-known Portuguese TV channel RTP, the national radio station RFM and many more. Thinking of this impact it all started in the weeks leading up to Web Summit by promoting our excitement. Our strategy to rock Web Summit with our crazy suits worked out just fine and by letting the crowd know who we are, what we do and energize them we can say we hacked Web Summit! We went home with a lot of hot leads and many entrepreneurs added to our business network. Do not underestimate the power of a thoughtful strategy to stand out of the crowd at Web Summit. Why don’t you hack Web Summit in 2018 with your business too? Marketing Madheads was at Web Summit 2017 with support from the Startup League. If you’d like to showcase your startup at an event, you must check out the amazing things that the Startup League can do for you to get there! Sign up, NOW.